For each position you can enter a comment. 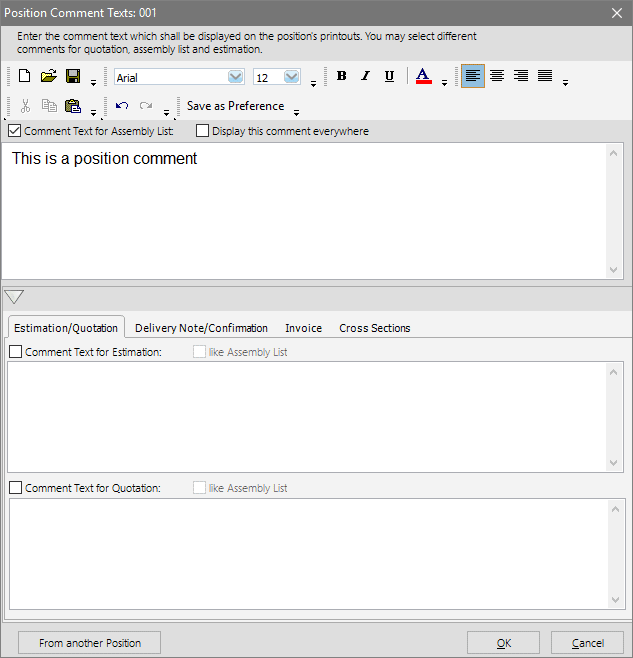 Right-click the position and select „Edit“ > „Position Comment“ in the context menu. In the upper area you can determine whether the comment text is supposed to be inserted solely on the work order or everywhere in the programme (e.g. in the cross section). For calculation, offer, delivery note, confirmation, invoice, and cross section you can enter your own comment. Activate the according check box with the name „Comment“ for <printout>. If you wish to use the work order’s comment text for other printouts, activate the function „like work order“. Comment texts can also be taken from other projects / positions. For this purpose click „from other position“ and select the project. Click the position from which you wish to transfer the comment text.